I was going to title this post “Why your Mother was Wrong when she Stopped you Pulling Faces in Family Photos”. Bit long, but I still have the same thing to say…a straight face is a bad and even worse, a Boring face. A smile is better, but when it comes to the world of humorous art, pulling a funny face for your photo makes a great caricature. What we don’t want are passport or drivers licence style expressions. Keep those for your morgue photos. Here is a recent example created by Harry, there the client’s staff rose to the occasion and were not only willing but eager to have their photos taken with wacky expressions!! 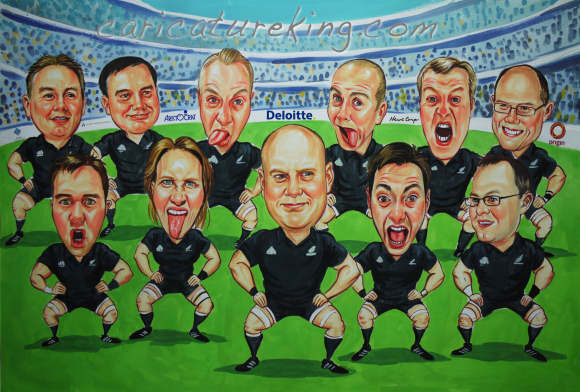 Sure as this was a caricature of the guys doing the haka meant they were more inclined to pull a face in front of the camera, but having some fun expressions really opens up the opportunity for something truly creative. Next time you are wanting a fun caricature for a family caricature (oh WOW, couldn’t we have some fun!) retirement, birthday, anniversary, or even wedding invitation (no better time to pull a face) remember, have fun! !